Let’s face it – in marketing, more money is always wanted, no matter the size of your budget. “If someone gave you $100,000 and said, “Invest this in your business by the end of the week – or lose it” what would you do? It struck me that the immediate response to the $100k question was (mentally) allocating it to his marketing budget…rather than his marketing team. Funnily enough, $100k doesn’t go that far in marketing – unless you spend it on PEOPLE or course. $100k could THEN get you two great part time, marketing-related people that have some specialist skills – they could action everything from social media to list generation to great articles to lead generation events to fostering partnerships. I’m sure you have a LOT of things you’d like to get done, if only you had the resources. So whilst it’s pretty rare that a lump of $$ drops in your lap, if spare funds do come your way, don’t just spend it in the obvious way. Really think about the BEST possible investment of your funds, which will be, more often than not, people over advertising. Market research is a funny beast. We feel like we SHOULD be doing it – keeping in touch with our customers, checking how we’re performing, working out what we should change, learning what’s important to prospects. Yet the research is a waste of time if you don’t do anything with it.In fact, it can even be damaging to your business if you ask but don’t action. Many times I’ve worked with clients who’ve done research – either one off, or ongoing – with little changing subsequently. I was browsing the web today looking for wall paper when I came across this site as an example. 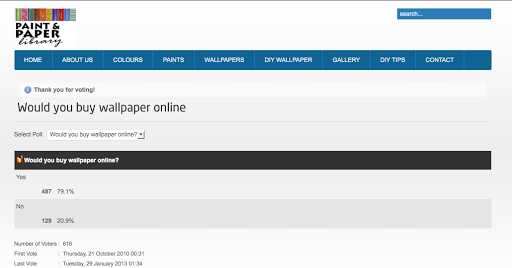 I saw they had a little poll about whether visitors to the site would like to buy wallpaper online or not. So I clicked yes, as I would like to buy it online. You’ll see from the screenshot, so would about 80% of other people. Yet this poll has been active three years and you still CAN’T buy wallpaper online at this site. Which is made just a little more frustrating because YOU KNOW that THEY KNOW that is what people want…which doesn’t provide for a great first impression. So the moral of this story – if you’re not going to do anything about it, don’t ask the question. Spend the time and resources elsewhere. You can put in all the love and effort and creative beauty into an online magazine, organise the best possible publicity on Australia’s most-read design blog – but it all comes to naught if you don’t check that it’s working first. 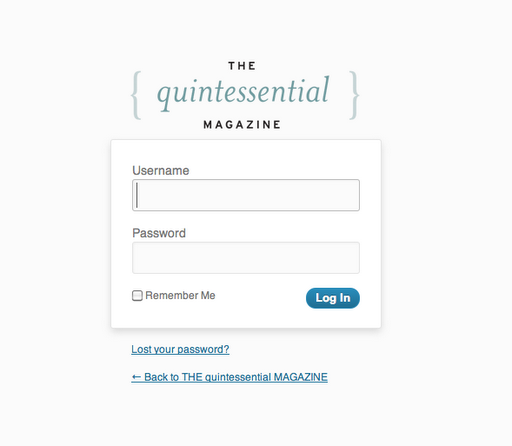 This is a situation I came across recently when a new mag was launched via The Design Files. I’m an avid reader of The Design Files (along with 20,000 other people) and it is very supportive of the Australian creative community, regularly featuring new projects and businesses. Due to the targeted nature of the readership, being featured on the Blog would be a huge (and free) marketing opportunity for a venture, tapping right into a perfect target market. So this temporary fail of a new magazine launch (not being “live” when the blog story went live) was also a great reminder that your marketing work doesn’t stop at the creative side. The best way not to WASTE money or an opportunity (as all zero budget marketers must know) is check all the details – and get it right the first time. I felt bad for them, I really did. It was up later in the day – but not a 7am which is when The Design Files sends their email EVERY weekday. Always. In this case, I can’t help wondering how many more people they would have reached if they’d just made sure their mag was live/published a few hours earlier? I’m sure they will always wonder the same thing. So here’s a checklist for any new launch / campaign/ initiative – these are all things that will trip you up (I’ve speaking from painful experience) so it’s worth checking them every time. – Emails and web addresses – type them in, even if you think you know them, and make sure they’re live or go where you expect them to. Oh, and make sure they’re actually ON there. – Call any phone numbers – again, just in case. One misplaced digit is all it takes. – Test – if it’s anything technical, try and break it. If it’s online, click on links and go to every page. It’s boring but essential. – Get it sub-edited – If you can afford a professional, invest in one – they are so worth it. (One that I use for a particular client ALWAYS finds something, even when I’m sure it’s perfect!) If you dont have the budget, then ask a friend or colleague removed from the project that’s good at grammar and spelling. Just have SOMEONE “sanity check” it. If there’s no-one, re-read EVERYTHING carefully. Don’t rely on spell check. – Call to action – even if it’s not an advertisement, you always want people to DO something. That’s the whole point of marketing. So is it clear what you want them to do, and how they should do it? For example: In the case of an online magazine, you want someone to READ but, more important initially, you want them to SUBSCRIBE. – Is everyone informed? – Do all the people that this project impact on know that it’s happening? For example, if you’re running a promotion, do the people who answer the phones know all about it? – Are all your marketing asset in sync? – If you’re running a new offer, is it on your website, your Facebook page, your email signature. – Have a promotional calendar with everything on it – so you make sure you don’t forget what is happening when. Check it regularly, to ensure a roll out is occurring in the right order, like a site being live before the PR program kicks off. Do you have anything else on your “launch checklist”? A business name is something you’re stuck with for a long time – you CAN change it, but it’s expensive (to change all that branding) and risky (because you lose any established knowledge of your name in the market). So it’s worth putting some thought into, not just from a creativity perspective, but from a practical approach too. I was chatting to a small business owner yesterday and she had a whole host of potential names for her re-launched business. I had a look through and instantly a few stood out above the rest. As I explained the reasons why to her, I thought it would be worth a post here to share what the same thoughts. – Keep it short. If you can keep it to one or two words, try to do this. The longer it gets, the harder it is for people to remember and they tend to mix it up. For example, I used to work with Flexicar. Great name. Except first it was “Flo car share” (yes, missing the “w”). Which people used to call “Flow carshare” “Flow sharecar” “Car flow share”. It got too painful. The moment we switched to Flexicar, everyone got it right, every time. – Memorable. Being a little bit different or quirky makes it memorable or catchy. But if it’s TOO quirky, you’ll find people won’t get it right. – Use real words that describe your business if you can. Don’t make people have to think too hard to work out what it is that you do. Be as specific as you can. There is a temptation to keep it general, like I did with Brazen Productions, as I planned to do a lot of things. However, if I had my time again, I’d make it Brazen Marketing as this is largely what I do. – Don’t get too tricky with the spelling. I’ve already given an example above with Flo car share. People also try to replace “s” with z or x, or add lots of additional letters. Not ideal as when people are talking about your business, as you need to reply upon them to convey the odd spelling. It can work – Grill’d for example – as they have a retail presence with their name displayed all over it. But they also bought the URL grilled.com.au just in case. There are exceptions to all of these – but they tend to be businesses that have a LOT of money to spend to build awareness, or businesses that have been around a long time. A name isn’t everything, but it can be a cheap shortcut to instantly promote what you do, which is why it’s an ideal zero budget marketing approach. A final word. Don’t spend forever agonising over it, or a logo. Think about it. Test it out of a few people who DON’T know what you do and see if they can pick what your business might be. Then choose something and move on to the business building part. If you’ve ever seen me talk about networking, I maintain that GOOD networking isn’t going out to “get” something. Good networkers look for opportunities to help people – to EARN the right to ask a favour. My marketing hero, Seth, talks about this in his own way in the context of social networking. It’s worth a couple of minutes of your time to watch (and thanks to Mark at The Fortune Institute for sending me the link). PS. If you can’t see the youtube box above, use this link: http://www.youtube.com/watch?feature=player_embedded&v=r0h0LlCu8Ks# ! I have worked with many clients over the years and some take some serious convincing that WORDS are as important as IMAGES in their marketing pieces. With online such a key delivery and marketing tool, words are more important than ever before. If you engage in email marketing, you should always balance words with design. Yet most of the “promotional” email lists I end up on (mostly online retail) insist on image heavy emails – going with the “picture speaks a thousand words” angle – that often are WASTED online. Because MANY people use gmail (or hotmail) for their primary address. And these programs are automatically set NOT TO display images (you can change this setting, but most people don’t). So this means you can invest in a designer to craft the most beautiful piece of creative…and half your audience will never see it. This is good news for zero budget marketers – as more of us can write than can design! So as long as your COPY is good, your emails can be effective. To illustrate: I’ve included a screen shot from an email I received in my gmail account. 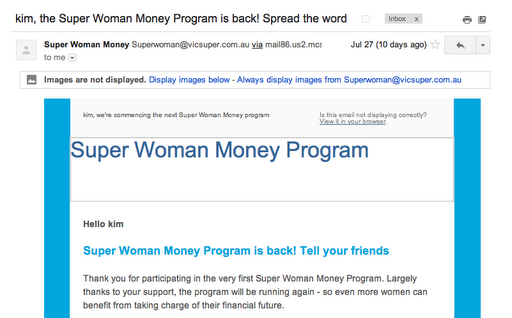 It’s for the VicSuper Super Woman Money Program, which is one I have been working on with them this year. There is a logo/image across the top that isn’t displayed BUT the email still works without this. So that if people DO get images, it looks great, and if they don’t, you still get an idea of what the email is about – so you’re more likely to click “view images” if the email interests you. In summary – images should COMPLEMENT the words, not seek to REPLACE the words in email marketing. And your emails should be able to stand up without ANY images at all, as this is how MANY of your prospects may receive them. PS. If you want to see what the email looks like with pictures, view online version here. Some people have raised procrastination to an art form. They want time to ponder, consider, discuss, weigh up options. All of these are worthwhile activities – but not endlessly. In ‘zero budget marketing’ TIME is money. So if you’re wasting time, you’re wasting your marketing budget. Yes, if you make a decision you might make the wrong one. But you might make the right one. Spending two months hand wringing, when you should have only spent two days, puts you that much further behind a potential benefit. It also means you’ve possibly met and discussed the same thing for hours and hours (or spent many hours inside your head). So if you’ve got something you’ve been pondering – make a call, or set a date when a decision must be made and stick to it. Sometimes the call is no, sometimes it’s yes. But make a decision and move onto the next thing. Can you find a subscription model? The best marketing is marketing that’s built in from the beginning. It’s not an afterthought, not working out how to sell something AFTER it’s developed. Smart marketing is considered AT THE BEGINNING of a product or service life-cycle. One of the most clever of marketing models – and thus sales models – is the subscription model. Why? Because you only need to “sell” once, but the sales keep coming in over months or, hopefully, years. It’s a pricing related concept, and pricing sometimes feels like the poorest of marketing cousins, but that doesn’t mean it should be ignored. Very profitable businesses are built on subscription models, from insurance to banking to utilities to media to professional services. So why not try and tap into this for your business? There is no reason it can’t work for many more sectors, if only they thought about it how to apply it. Don’t believe me? If it can work for PET FOOD and EMERGENCY SUPPLIES, then it can work for a whole LOT of products and services. Go on, think about it. Cruising the web sometimes uncovers some handy tools. I’ve just come across The Small Business Mentoring Service’s Marketing Plan guide. It isn’t just a “fill the blanks” but gives you some guidance as to what should be included in a marketing plan. Whilst preparing a full marketing plan isn’t everyone’s cup of tea, it can be a worthwhile exercise for anyone with a great idea, but little idea of how to move forward with it. If you come from a marketing background you may not need the help, but if you don’t, you’ve probably identified marketing as a critical success area – since it’s the area that will ensure you get some $$ coming in the door. Preparing a marketing plan could even be more important than a business plan, which tend to be written without enough practical detail. Do you have a call to action ON EVERY WEB PAGE? What do you want a website visitor to do at the end of each page they read? You will want them to read another page, sign up to an email newsletter, contact you, like you on facebook or even buy from you! But do you ask them to DO this? If your website isn’t brand new, you probably haven’t looked at it critically in a long time. Not only will there be out of date information, there will likely be a better way to say much of what you’ve written and you’ll find a call to action is probably missing from most pages. You might argue that you’ve got buttons or links people can use to “buy now”. But why make it hard for your visitors? Why not take them on a journey; tell them where to go next from each page and what they should do. You might keep them engaged just that little bit longer, which gives you just enough time to ‘convert’ them. 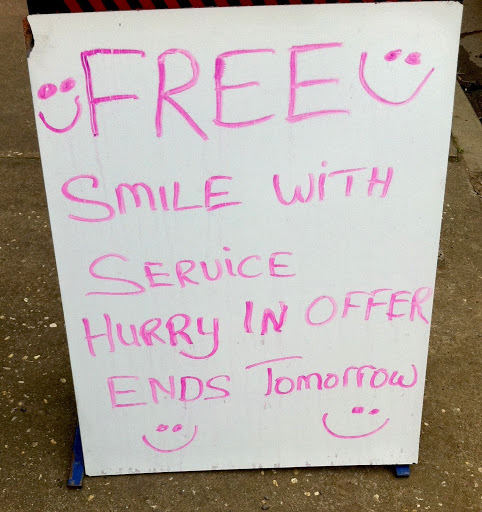 You need a call to action in ALL of your marketing communications (just like the fabulous zero budget marketing sign in the picture) and your website is no different. Each and every page of your website is a piece of marketing communication. Make sure you ASK people to do something on all pages, not just the promotional articles. So put your marketing web audit in your diary now. 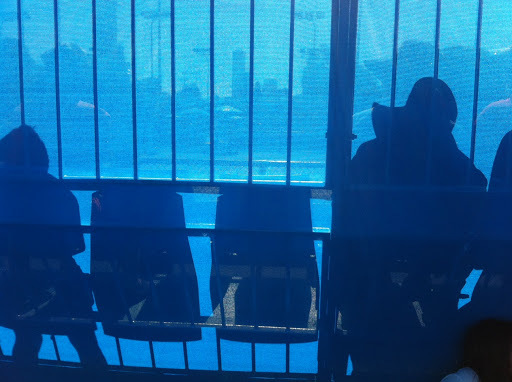 Not exciting, not glamorous – but it will be effective.